Everyone I’ve ever told about this recipe have raved about its taste. It’s hearty, it’s healthy, it’s easy to make, only uses one pot and it tastes damn good. I discovered it one day when watching Good Deal with Dave Lieberman on TV. “Wow, that looks simple and delicious,” I thought. And so I immediately went looking for the recipe on the US Food Network website. I’ve made it enough times now that I’ve adjusted some ingredients to fit my own personal taste. Makes approximately 4-6 large servings. Heat the olive oil in a large pot over medium-high heat. Add the onion and garlic, and sauté until the onions begin to turn translucent (lower the heat if browning starts to occur). Add all your spices spices and sauté for a minute. Add the tomatoes, chickpeas, broth and sugar. Add a pinch of salt and approximately 10 grinds of fresh pepper. Don’t forget to stir as you add each ingredient. The chickpeas should be just covered with liquid; if you don’t have enough liquid add some water. Bring the soup to a simmer, then lower heat to low and gently simmer for approximately 45 minutes. Basically, you want the chickpeas to soften enough so that there is no bite. Remove the soup from the heat and use a potato masher to mash up some of the chickpeas (but not all of them) right there in the pot. 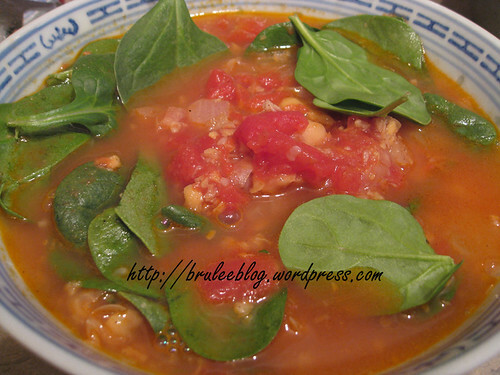 Spoon out your soup and add plenty of spinach to each bowl, stirring until the heat just starts to wilt the leaves. If you’re serving the entire pot, go ahead and add your spinach to the pot instead of into individual bowls. Add additional salt and pepper if necessary, and serve the soup lightly drizzled with extra-virgin olive oil, if desired. Unfortunately, none of them are the one that I usually use (Campbell’s ready-to-use reduced sodium in a carton) so I can’t compare. I don’t even think the ones they examine are ones I can find here! But there is an interesting comparison to Mark Bittman’s “veggies into a pot of water is better than commercial products” recipe.